Not all wars are won on the battlefield and not all soldiers fight in combat. Some remain invisible, away from direct combat, and yet risk their lives to protect the honour of their king and country. These are the faceless heroes of war-the spies-who collect classified information about the enemy, skilfully helping the ruler and the government to safeguard their own territory. Packed with acti.JrI, Adrishya is it collection of India's greatest spy stories. It captures the lives of spies- extraordinary men and women-through the danger, the fear and the triumphs. It narrates their heroic acts and follows them as they travel through dangerous landscapes, slip into disguises and hoodwink enemy soldiers. Starting off with India's first spy from the Mahabharata to the RAW officials of the 1971 war, this book is a collection of real spy stories which will entertain and inspire at the same time. This book is based on EPIC Television's popular show by the similar name- 'Adrishya: True Stories of Indian Spies: It features select stories of the greatest Indian spies from the times of the Mahabharata to RAW spies during the Bangladesh Liberation War in 1971, and many other interesting ones in between. Adrishya: Stories of Great Indian Spies makes you experience life from the point of view of India's greatest spies, living through danger and possible death, fear and anxiety, the triumphs and the captures. It narrates the spies' heroic acts and follows them as they travel through dangerous landscapes, slip into disguises and hoodwink the enemy. We become privy to their thoughts as they inch towards fulfilling their mission. Featuring stories from different eras, the book begins with a lesser-known tale from the master of all epics-Mahabharata. 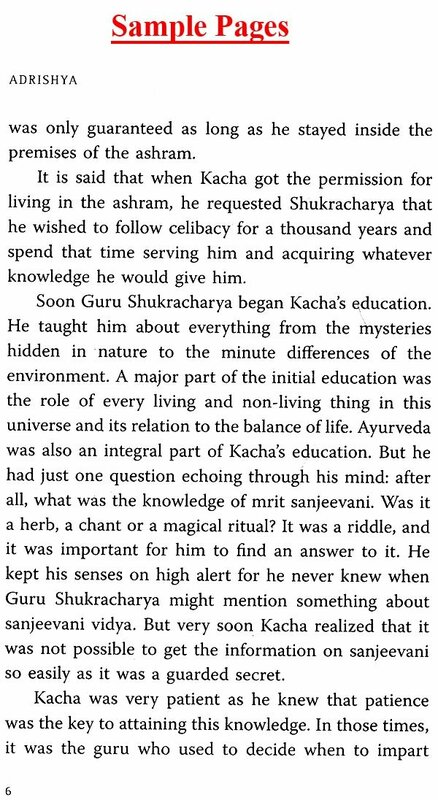 Guru Brihaspati's son Kacha, the spy of the gods, was sent by Lord Indra to learn mrit sanjeevani vidya from Guru Shukracharya, a knowledge which would make the gods immortal. While he achieved his mission, it came with a heavy price. Next is Ieev Siddhi, Chanakya's spy. He assisted his guru Chanakya in saving Chandragupta Maurya's life and expand his kingdom by strategically defeating King Nanda's minister, Rakshasa. The work of a spy can be varied. They need not always be warriors. Like Chand Bardai-who served under Prithviraj Chauhan, the king of the Hindu Chauhan dynasty that ruled over Ajmer and Delhi-was a court poet, a jester and a master of disguises. Faithful to his master, Bardai was involved in helping Chauhan's beloved Sanyukta escape from Kannauj on the day of her swayamvar. 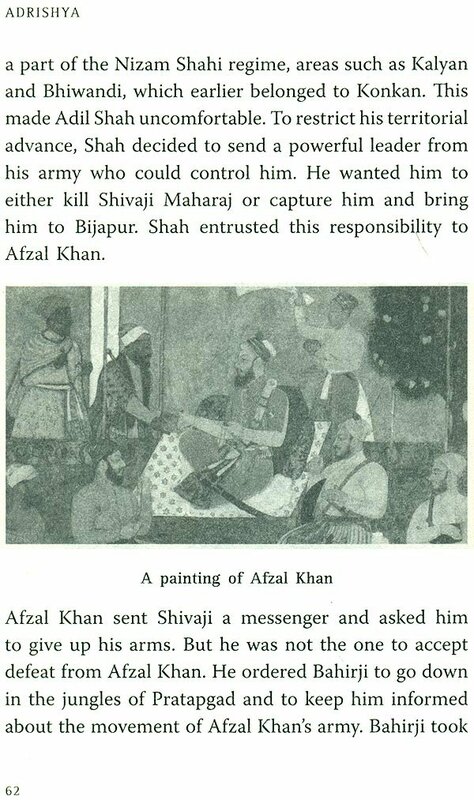 Later, when Prithviraj Chauhan was blinded and imprisoned by Mohammad Ghori of Ghazni, Bardai plotted a way for Chauhan to seek revenge from the cruel Ghori. 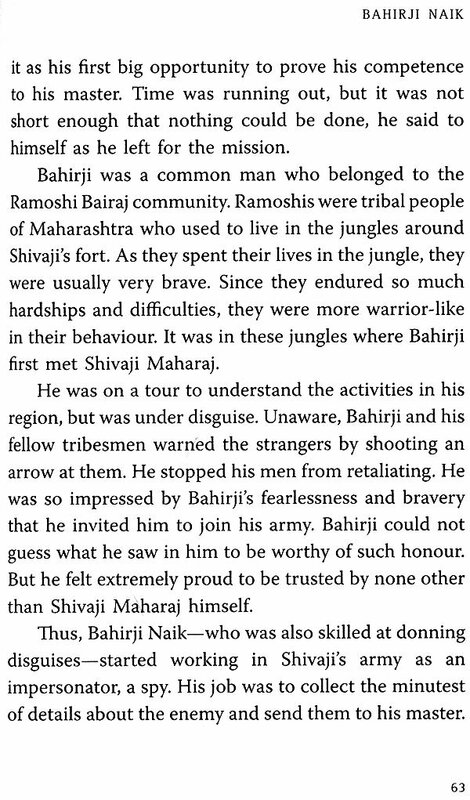 Bahirji Naik, Chhatrapati Shivaji's chief intelligence officer, was a master of disguises and one of the early practitioners of a form of guerrilla warfare called Ganimi Kawa or Shiva Sutra. Then there is Sharan Kaur, who was saved by the army of Hari Singh Nalwa, the great commander of the Sikh empire of Maharaja Ranjit Singh. She returned the favour by becoming a warrior spy, helping Nalwa counter the ferocious attacks of the Pathan tribes and their cruel leader Dost Mohammad. Sharan braved to go where no Sikh man would go. Aziz-Un-Nisa's and Durga Bhabhi's stories are of exemplary courage. 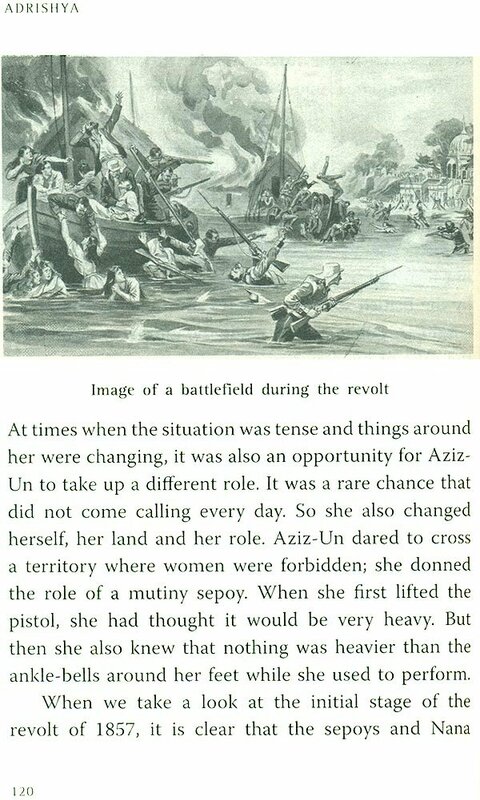 Aziz-Un, a courtesan, who had travelled from the cultural city of Lucknow to the gritty reality of Kanpur, just to maintain the independence of her choices, turned against the British and started out as a spy. But after the British killed the man she loved, she didn't hesitate from actively participating in the planning of the uprising of 1857. Durga Bhabhi is another revolutionary Indian woman spy. Married to a freedom fighter at the age of eleven, Durgavati Vohra was actively involved in the planning and execution of several of the Hindustan Socialist Republican Army's (HSRA) activities. She is best known for having travelled undercover with Bhagat Singh when the British police was on the lookout for him in relation to the murder of Saunders. 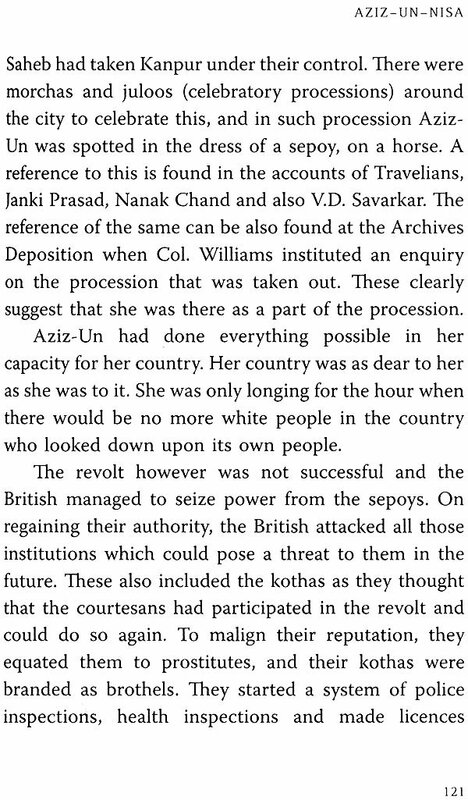 The story of Noor Inayat Khan is equally interesting. A Sufi poet, a princess by birth and a children's author, Noor, despite her Sufi background, becomes the sole link between the rebel groups of France and their support system in England during World War H. How she gets into the elite secret services of Women's Auxiliary Air Force (W AAF) accounts for a fascinating story. 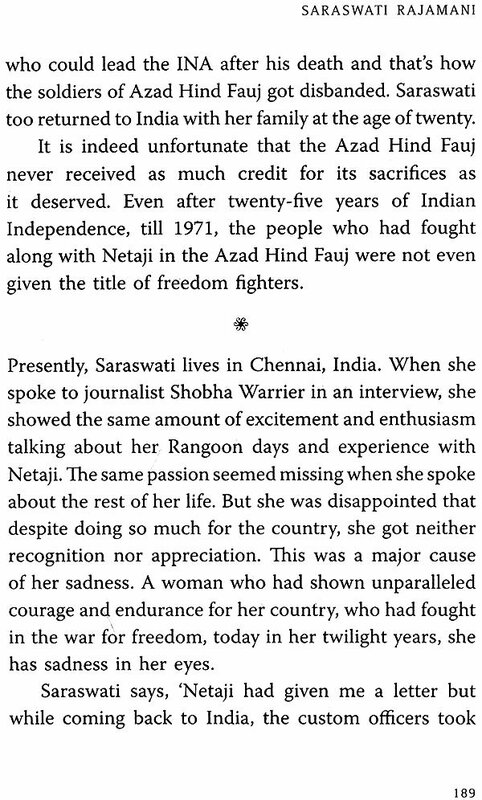 Saraswati Rajamani was Netaji Sub hash Chandra Bose's spy in the Indian National Army (INA). 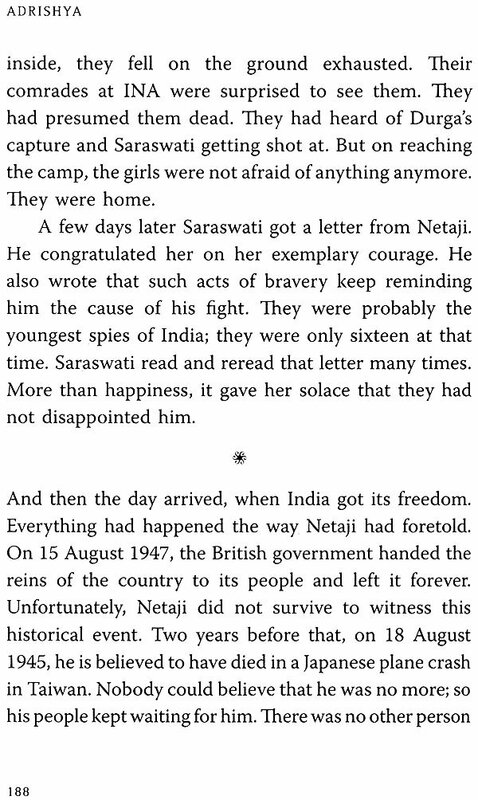 Saraswati joined the INA at a young age and infiltrated British army ranks to gather intelligence for Netaji which helped him in his active resistance to the British Raj. The story also captures her escape when she was caught by the British forces. The story of the creation of Bangladesh is incomplete without the mention of two Indian intelligence officers, R.N. Kao and K. Shankar Nair. While Kao planned meticulously from Research and Analysis Wing (RAW) headquarters in New Delhi, K. Shankar Nair was on the field as the freedom struggle in East Pakistan raged. The chapter details their heroic deed in saving countless lives and achieving freedom for India's neighbouring country. These myriad cases give us a glimpse into the dangerous lives of the unsung heroes of wars while reaffirming the importance of their roles in the safety and security of the nation. These are stories that will inspire and entertain at the same time. The information in these chapters is based on critical inputs provided by scholars and experts for the TV show. In a few chapters, the spies, who are still among us, have shared their experiences too. This book doesn't claim to be a history book but gives us an insight into the lives of spies, told in these very interesting story formats.